Defiance Games wants everyone to know they've got a case of worms (probably many cases) and they want to share them with you. So they've announced their new Aleutian Swamp Worms. Defiance Games has unveiled a previously unseen plastic set coming in September. Aleutian Swamp Worms are big beasties who can swallow a man whole. Special rules will allow you to add them to your ALIEN WAR games. 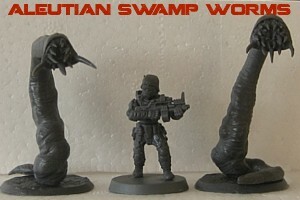 Sculpted by Ed Fortae the Worms will come 8 to a box with 8 40mm bases and 2 40mm worm burrows.